Home › Gay Rights › Gays & Christians & Agnostics are equal some of the time, but not others. Gays & Christians & Agnostics are equal some of the time, but not others. A law was recently passed in Illinois allowing business owners to deny service to gay (or other) clientele based on their religious beliefs. The irony of this law is that it is establishing a right that we already have as free individuals with the freedom to associate with whomever we please but does so in such a way as to assume that one of these two groups previously had more rights than the other, and this law is simply bringing equality back when there was never an imbalance to begin with, except the ones that Government created in order to “solve” it. What do I mean? If you oppose this law, then what you mean to say is that individuals, regardless of religious belief, should be required to provide services to gay individuals, against their will. If I don’t like someone, personally, it is not illegal for me to deny providing them a service. If a girl walks in with a name of a girl who dumped me (no names come to mind), I can deny selling her something. If a blonde walks in, and I prefer brunettes (which I do), I can deny selling her my products. None of this is illegal. But if a gay person walks in, and I deny selling them a product…well…now I’ve just crossed a line and can be punished accordingly. Therefore the right of gay people to associate with whomever they please supersedes my right to associate with whomever I please. Their rights are greater than mine. Or, in the immortal words of Orwell, “All are equal, but some are more equal than others.” Gay rights are more equal than Christian rights, or an agnostic’s rights, in this instance. Illinois attempted to rebalance that imbalance by passing a law that due to a religious conviction, all men are equal, and no more equal than others. Their mistake was to focus on religion as that which makes men equal. Religion has nothing to do with it. The individual right of the freedom to associate is the right we are all born with. There are no gay rights, women’s rights, black rights, Islamic rights, Jewish rights, short people rights, fat people rights, there are only INDIVIDUAL rights. The prefix matters not at all. We, as individuals, regardless of who or what we are, are free to associate, or not associate, with whomever we please. When we begin parsing the population into sects, which Government then loves to pit against one another, riding to their rescue in exchange for votes, we lose sight of the reality that we are all equal. Some are not more equal than others. What you do, or who you are, or what you eat, or what you believe, or who you sleep with, or what you read is nobody’s business but your own. Illinois took a step in the right direction, but for the wrong reason. Gay business owners have the right to not do business with homophobes just as anyone, religious or not, should have a right to not do business with someone who may also happen to be gay, or short. Until we accept the concept of the individual right of free association, we will be mired in the pit of Government granted and retracted privileges (not rights), that will ebb and sway depending on the emotional moment of the majority and the political composition of the Government, a world of constant chaos and impermanence. If you would like to read more on this topic, the rest of this post explains how ethical foundations have been constantly diluted by Government, propaganda and group think to the point that every ethical tenant we teach our children, such as not to steal, not to hit, not to lie has now become true only insomuch as society or the eye of each individual beholder at any given moment deems it true. And a world where stealing, hitting and lying is only wrong in certain circumstances and right in others heretofore judged by the majority or a Government, is nothing more than a world in anarchy. For example…is it ethical to steal? Is it ethical to steal a sports car? Is it ethical to steal from the rich? Is it ethical to steal from the poor? Is it more ethical to steal from the rich than the poor? Is it more ethical to steal a watch versus a pack of gum? Is it ethical to steal a chocolate bar for your child if they are hungry? Is it ethical to steal a chocolate bar for your child if they are going to die from hunger? Is it ethical to steal a chocolate bar for your child if they are going to die from hunger from another child that is also dying of hunger? So, in this way our society of today has entered into the abyss where it is ethical to steal in some situations but not others? Where some things are less ethical than others. Where truth is not absolute, but based on a sliding scale that moves with popular opinion or the will of Governments. If that is the case, then who is to be the moral authority that decides in which cases it was ethical to steal and in which cases was it not? And who chooses who that authority is going to be? Ethics is universal. It is unethical to steal. If we teach our children that it is okay to steal “sometimes” then each child will interpret that differently and the very definition of “stealing” comes to mean nothing more than any particular person’s definition of it at any particular time based on thousands of variables. It is in this way that society is thrown into chaos as simple ethical and moral values are now defined by nothing more than how “the eye of the beholder” interprets it in any given situation. This is anarchy. Chaos. We become a nation based on opinion, Likes, Tweets and Snapchat, not ethical rights. Individual rights are universal. No one individual has more rights than another, ever. That is universality. If we teach our children that some people have more rights than others, then each child will interpret that differently and the very definition of “rights” comes to mean nothing more than any particular person’s definition of it at any particular time – and that is what we have today. If we do not have the right to not engage in an arrangement with someone else, then it is, by definition, not voluntary – that makes it mandatory. Using coercion to make someone perform a mandatory task is a definition of enslavement. Simply ask yourself, were blacks coerced by force to pick cotton mandatorily? The answer is yes. So if you want to require Christians (or anyone else, even agnostics) to serve gays, via the force of Government coercion, that is enslavement. And those who would argue this are, again, falling into the trap I set before of, “is it ethical to steal” wherein we shall not call this enslavement because, in our new world of chaos and anarchy, all words and concepts now mean no more than how any particular individual cares to interpret it at that moment in time based on their own personal beliefs and experiences, which of course, changes as often as you change individuals. Chaos. 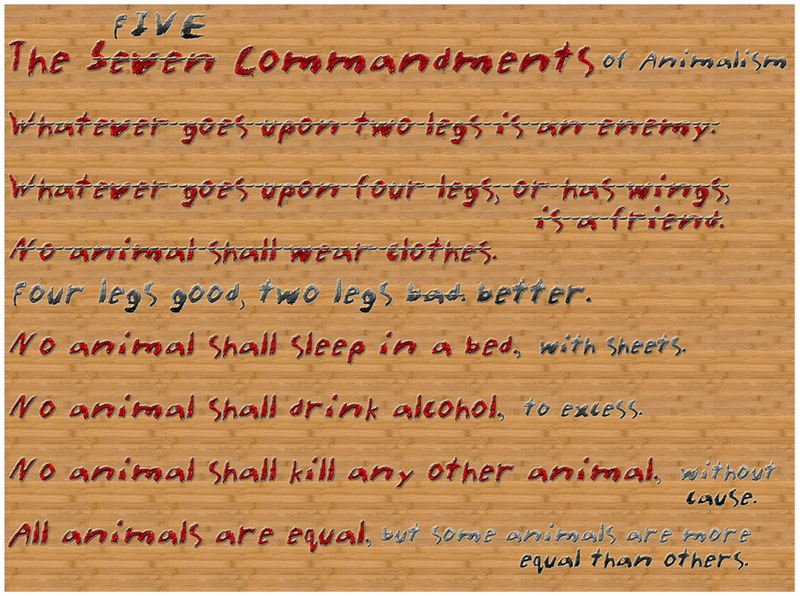 As we read in ‘Animal Farm’, the animals began with basic rights, and slowly parse those rights to allow certain individuals to be more equal than others. Our Government does the same. Our media regurgitates it. Our nation swallows it and accepts it as the new ethical truth and then it goes viral on Facebook and becomes national opinion, and national ethics, until a new one comes along. This is the creation and distribution of privileges and the erosion of ethical, universal rights. Let’s break it down. A gay couple. They have the individual right to freely associate with each other. In popular culture this is known as “gay rights” but it is not gay rights, it is simply individual rights. The “gay” is extraneous and unnecessary, as would be black, white, Asian, male, female, trans, old, young, Christian, Muslim, Jewish, tall or short. Do you believe in individual rights? Do you believe that male individuals have more rights than female individuals? Do you believe that Jewish individuals have more rights than tall individuals? Do you believe that young individuals have more rights than Asian individuals? Do you believe that black individuals have more rights than white individuals? Do you believe that Christian individuals have more rights than gay individuals? Do you believe that gay individuals have more rights than Christian individuals? Just like in the “ethical to steal” example above, we have the same de-evolution of a basic ethical and universal principle into chaos. Governments prefer the chaos because it allows them to parse society into sections and pit them against each other, with the Government promising to be the arbiter of freedom and justice, in exchange for votes and money of course, when the sad reality is everyone already has the same freedom and justice, but Government makes it look like they do not. This is how Government justifies its existence. If we just agreed that we are all equal, there would be no need for Government coercion. It is paramount for Government to make us unequal, then attempt to resolve it. Consider the last two questions above. In the first of the last two questions, for the current controversy, many would say that a law that allows Christian individuals to not perform services for gay individuals is elevating the Christian “right” above the gay “right.” Christians have more rights than gays, in this instance. But in the last question, if you say that Christian’s must perform services for gay individuals, are you not simultaneously admitting that a gay individual’s “right” now trumps a Christian individual’s “right?” Gays have more rights than Christians, in this instance. Do you see the problem? In either outcome, someone has more “rights” than someone else, and all we are doing on social media and in the news and by using Government coercion is picking whose right trumps whose. We are saying who has more rights than others. We are saying that individual rights do not exist, all that exists is individual privileges and that the Government is responsible, based on the will of the majority, or itself, on who will receive what privileges and who will lose privileges. We have become not a nation of rights, but a nation of privileges – chosen for us by others. And once you agree to go down the privilege road, then you agree to allow Government, or the majority, or both, to determine what privileges you have and which you don’t have which can change with the majority, or the Government, on a whim. Who will choose who has what privileges? Who will choose the chooser of the privileges for all of us and our children? This is anarchy. Chaos. The ethical reality is that we are all equal. This is a universal truth that protects everyone from everyone. If you truly believe we are all equal, then you believe in individual rights and freedom of association. This means that gay people can get married, or not. It means Christians can provide services to gay people, or not. This is freedom of association. With this freedom, Christians have no “right” to tell gays what they can and cannot do, including getting married, and simultaneously, and equally, gays have no “right” to tell Christians what they can and cannot do. It means we all have the same universal right to associate freely with each other or not associate with each other. If we cannot agree that ethics are universal, and apply to all men equally, than we abandon ethics for transient sentiment and the will of whoever is in power at any given time. I don’t want to live in that world. To not believe in this freedom of association is to invite the anarchy of Government and majority imposed privileges. It is to admit that some people have more rights than others, or as Orwell wrote in Animal Farm, “All are equal, but some are more equal than others” which he wrote to address this exact misinterpretation, this trap, that Americans fall into time and time again.